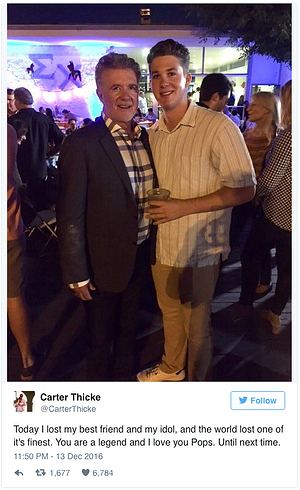 It's a sad day when anyone passes away, but at National Fatherhood Initiative (NFI), our thoughts are with Alan Thicke's family, the father of three we honored in years past, who recently passed away after suffering a heart attack while playing hockey with his 19-year-old son, Carter. We often talk about the father absence crisis in America, but we also focus on good dads that are doing great things for their children and society. One of those dads was Alan Thicke. 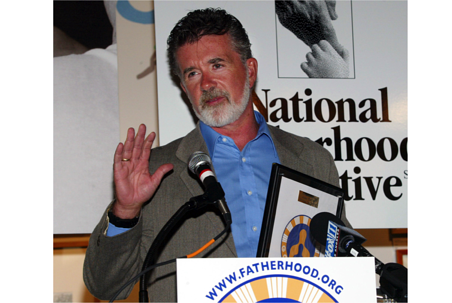 You can read any number of news stories from here and here, but one thing you may not realize is that Alan Thicke was selected for NFI's "Golden Dads" award years ago. KTLA featured this article on Thicke. We at NFI teach fathers the importance of communication, relationships, and connecting with your family. Thicke did this and more. Alan Thicke, the TV actor who epitomized the role of the sitcom dad, was nothing less than a gem. Thicke's career spanned five decades -- one in which he played various roles on and off screen, from actor to writer, to composer to author. But, he will be remembered most for his TV dad role on "Growing Pains," the hit sitcom featuring his character of Jason Seaver. All too often, dads are portrayed in television as the "dumb, doofy, or stupid" guy that doesn't have it all together (while mom generally does). But in this role during the 1980s, Thicke portrayed an involved dad who offered wholesome life advice to his family. Thicke was born in Ontario, Canada, in 1947. He began his career in Canadian television before moving behind the scenes in American television. He is survived by his sons Brennan, Carter and Robin, as well as wife Tanya. In the wake of Alan's death, Carter remembered his dad, not as the television father, but as a "best friend and my idol". "The world lost one of it's finest," Carter tweeted. "You are a legend and I love you Pops. Until next time." Entertainment Tonight wrote about Robin Thicke posting on Instagram writing, "My Father passed away today. He was the best man I ever knew. The best friend I ever had. Let's all rejoice and celebrate the joy he brought to every room he was in. We love you Alan Thicke. Thank you for you love. Love, your grateful son." From National Fatherhood Initiative, we say thank you, Alan Thicke, for not only being a great TV Dad and role model for America, but also a great dad in real life to three sons. We hope your fatherhood legacy lives on forever. For more details, watch the video here.